Our new doeling, “Tillie” is naturally polled. 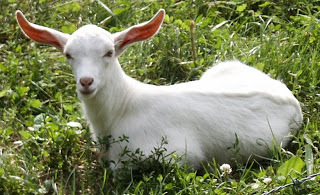 She comes from a horned Registered Saanen Buck and a naturally polled mixed breed Doe (Boer, Nubian, Saanen). Her twin brother was horned and has been disbudded. Spinning Yarns from the Farm: Polled Goat Genetics.